A perfect holiday for a honeymoon, special occasion or just when you deserve a little indulgence. Fly into San Francisco for a few days to explore all that this charming and fun city has to offer. Whether it’s careering around the streets in a two-seater GoCar, sampling the local tastes on a Foodie Tour or cruising the bay on a champagne sunset cruise, you can choose just what you want to do. 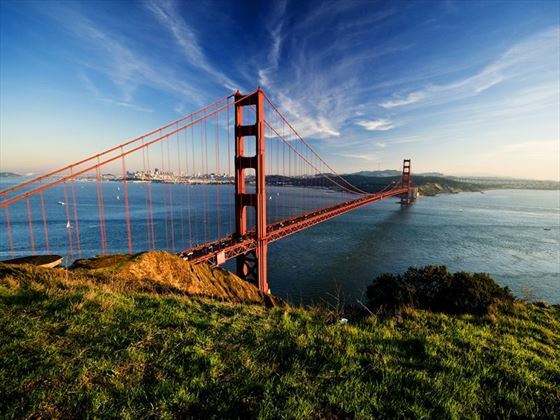 Then you’ll head north over the iconic Golden Gate Bridge into Wine Country. 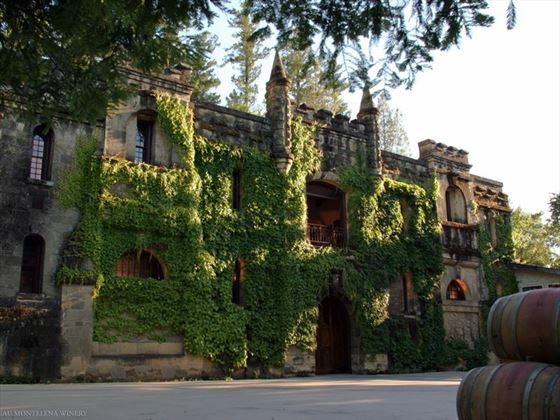 We’ve planned a couple of days in Sonoma, with its beautiful historic centre, and a couple of days in Napa, arguably the wine capital of the world, but we can amend this if you’d rather base yourself in just one location. There’s plenty to do in both places, combining outdoor pursuits with sampling the local produce. And there’s a great selection of hotels to choose from, depending on your budget. 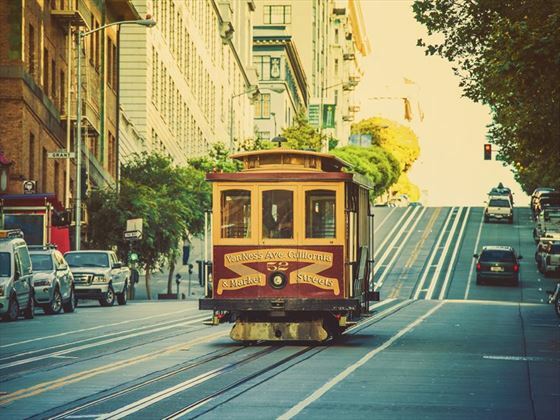 Arrive into The City by the Bay and either pick up your hire car or get a cab to your chosen hotel. We suggest that you don’t pick up your hire car until you’re ready to leave the city as there are so many better ways to get around. 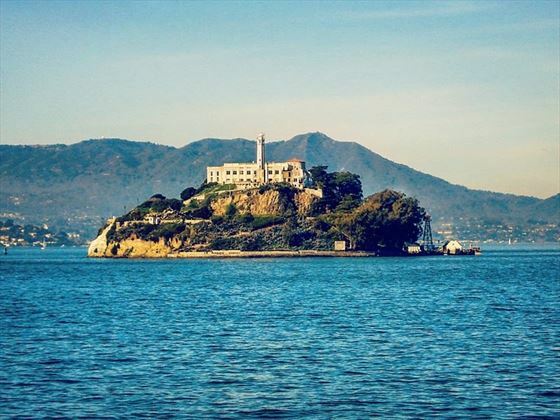 You have a couple of full days to explore this exciting city and you might want to start with its number one attraction – the prison island of Alcatraz. You will need to book your tickets well in advance as this tour sells out on a daily basis. The trams are a great way to get around the city, and once you’ve worked out where each of the three lines go to, it’s simple to navigate. Each journey will cost $7 or you can buy a day pass for $21. This evening you can explore one of the lively districts such as Union Square or Chinatown. There are several different choices for touring San Francisco, bus, bike, Segway or perhaps you might want to do a Foodie Walking Tour. But the most exhilarating way to explore the city is the GoCar – two-seater mini-cars that you can zip around it with the help of a Sat Nav to show you around. We can book any of these options for you before you start your holiday. Pick up your hire car in the morning, then head over the Golden Gate Bridge. It’s only a short drive to Sonoma so there’s plenty of time to call in to the charming town of Sausilto, just over the bridge, where you find cute boutique shops and swanky mansions. Also worth a visit en route to the Sonoma Valley are the John Muir Woods – here you can marvel at the sheer size of the giant redwood trees. Once you arrive in Sonoma, you’ll want to ditch the car so that you can crack on with tasting the wonderful and varied wines of the area. This is a gorgeous town with a historic heart, and so you can have a wonderful day just exploring on foot. Sonoma Plaza is surrounded by colonial buildings including the Mission San Francisco and the Sonoma Barracks dating back to the city’s Mexican colonial past. 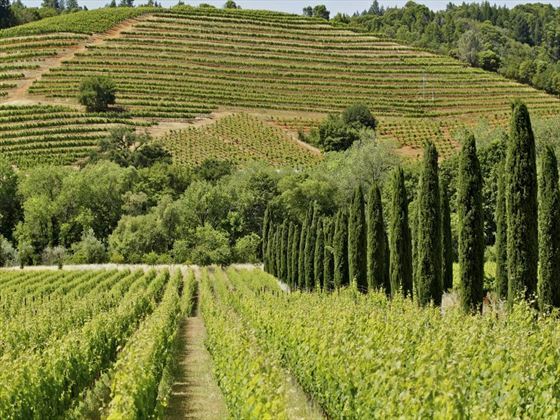 There is a lovely walking trail around this district, which also takes in various wineries and shops offering cheese and local produce, so you can break up your stroll to sample the best of the region. 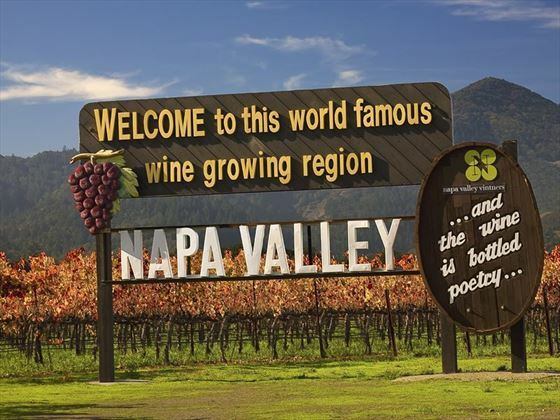 After a relaxed start, take the short drive to Napa. You could spend the afternoon cycling the country lines – either just admiring the scenery or taking a guided tour to small family owned wineries. Or you could hire kayaks to paddle the Napa River. 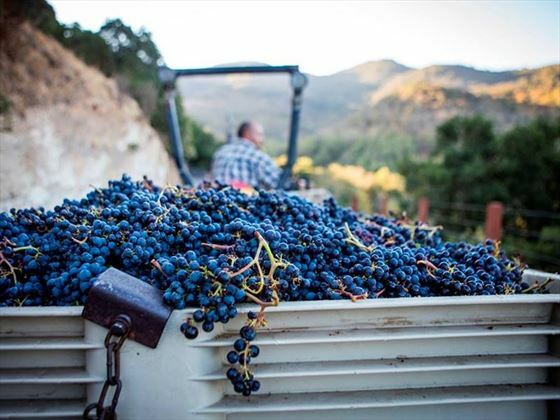 You’ll find myriad restaurants and wine rooms in this charming town – one of our favourite hotels, the Andaz Napa, has twenty wineries within walking distance. You’ll be spoilt for choice. Today you should take the Napa Valley Wine Train. 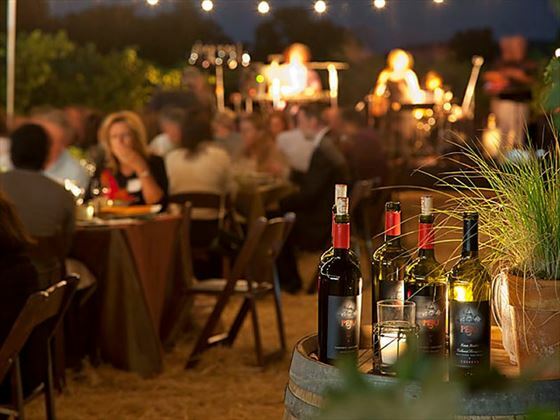 Board the vintage railcars and travel through 36 miles of beautiful wine country. 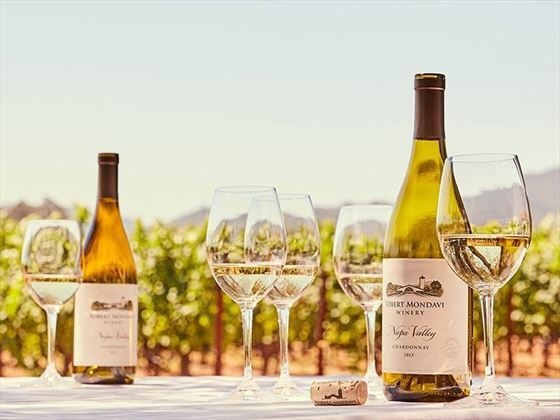 The train is famed for its cuisine as well as the wine selections, so just sit back and enjoy three hours of indulgence as you travel through the western side of the Napa Valley. You will have your flights home from San Francisco this afternoon, but it should only take an hour and a half to the airport, so you’ll have time to buy a few souvenirs of your holiday before heading off. Located near the Sonoma Plaza, this is a lovely affordable hotel for those hoping to relax and unwind in between shopping, wine tasting and enjoying gourmet dinners. Surrounded by splendid wineries and beautiful countryside, there's a homely feel to this hotel, with friendly staff and comfortable rooms adding to its charm. Take a dip in the relaxing saltwater pool, start your day with a complimentary breakfast, and enjoy a yoga class. Andaz Napa is a stylish hotel set in downtown Napa, where you can enjoy the simple pleasures of wine country. We love this location in the lively West End district, because it is a short stroll to more than 20 tasting rooms featuring some of the best wines of the Napa Valley. Decorated in an natural earthy palate, with comfortable bedrooms featuring tasteful wooden floors and white marble bathrooms. There are convivial lounges and terraces to enjoy a glass of wine and locally produced food, so you can't help but relax in this personable boutique hotel.